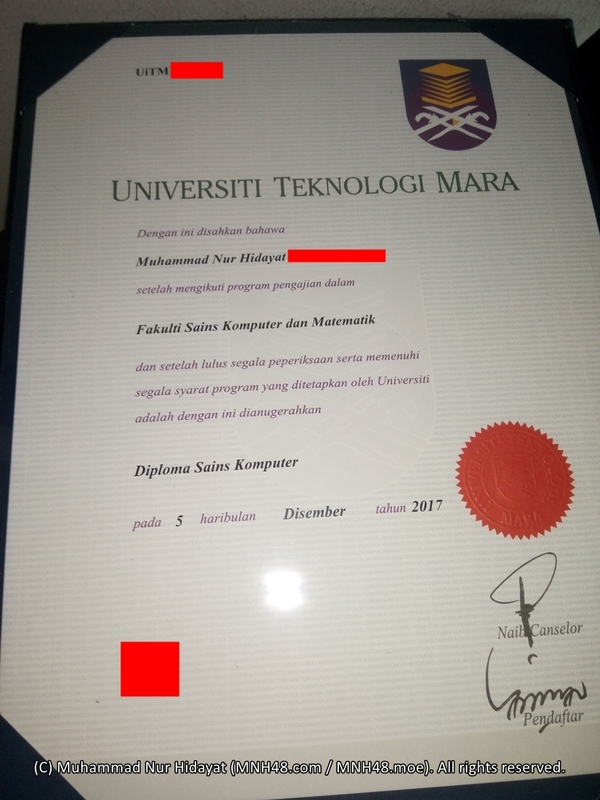 Diploma is one of the education stage that people take after completing form 5 of secondary school, and is one of the accepted qualification to further study in bachelor. Students who don't take diploma can also opt to either take single/double-year matriculation, continue to two years of form 6, or take certain types of qualified certifications. 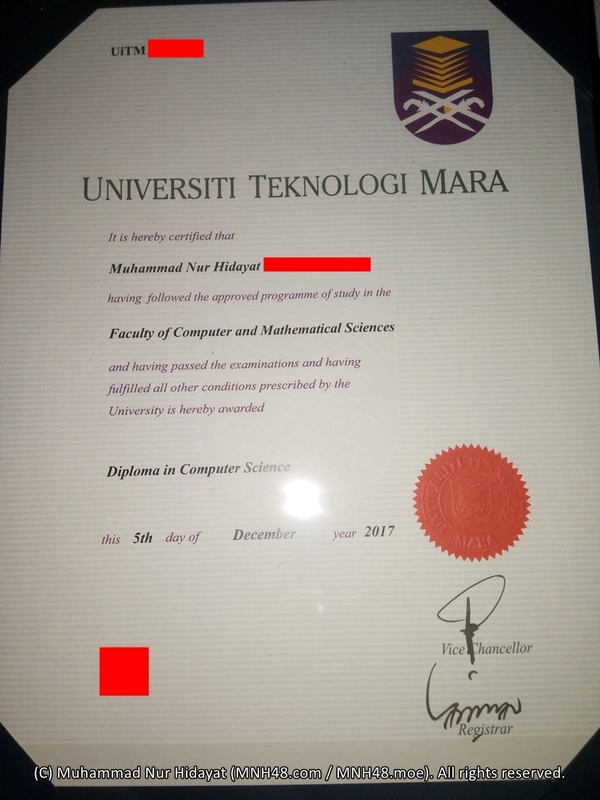 Most students who take diploma are students who want to study at their own pace, as diploma took the longest time (2.5 to 3 years) to complete and the courses timetable of diploma is not as strict as timetable from matriculation, form 6 or certificate. 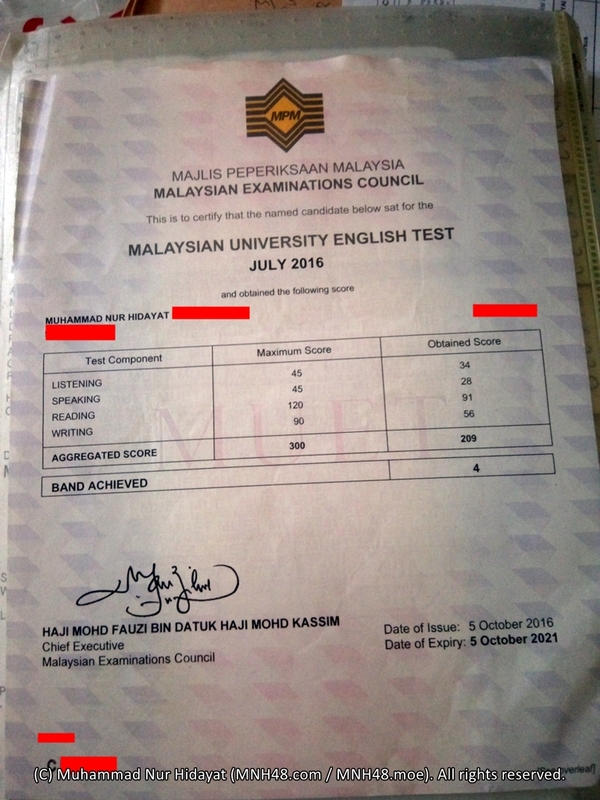 After getting SPM results, students are given time to apply for whichever education stage they wanted, either continue to form 6, or get into matriculation, or take university diploma, or take polytechnic/college certification. 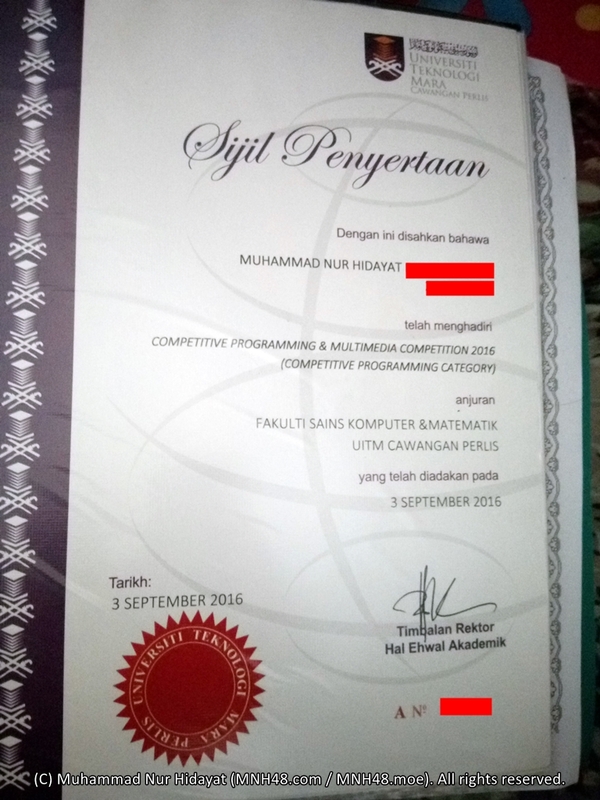 For students who want to take diploma like me, we need to apply at University Management Unit (UPU). The process starts with buying UPU-specific PIN-code at nearest BSN bank counter or BSN's ATM machine, register an account on UPU's website, then use the PIN-code to apply for universities after logged in. There are many choices of programmes across universities and you can select minimum 5, maximum 8 programmes that you want, and UPU will decide if you're eligible for the programme, one-by-one according to the choices you have chosen. If you agreed the option to receive programmes other than your choice and none of the programmes of your choice are eligible for you, then UPU will randomly assign you to any programme on any university and you can't change it, you're also ineligible for appeal. However if you declined the option, there will be an appeal round and you can choose other programmes. 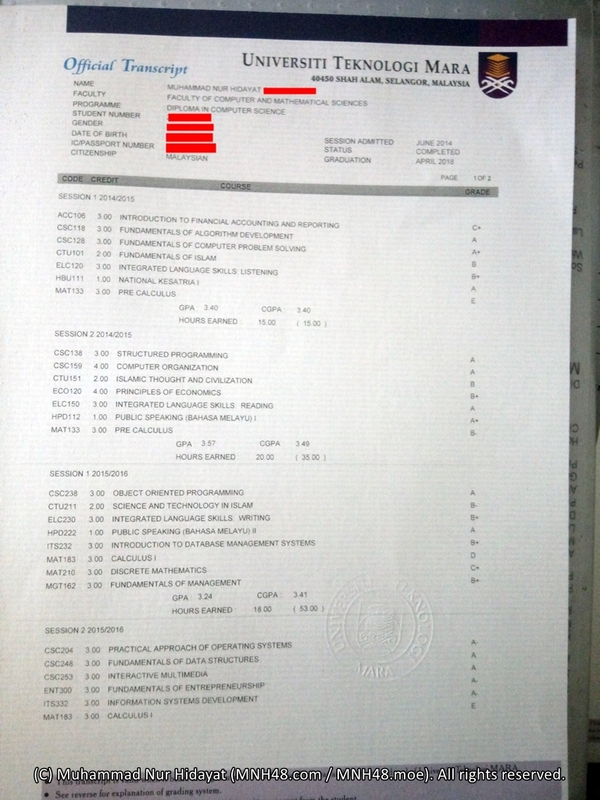 My first two choices were engineering programmes which I don't really interested but I tried anyway because someone told me those programmes could send me to oversea as exchange students, whereas the rest choices were either computer science or information technology, because I'm very interested in computing and technology in general. While waiting for the result, I get to attend a few days of classes of form 6 in the nearby secondary school, SMK Aman Jaya. 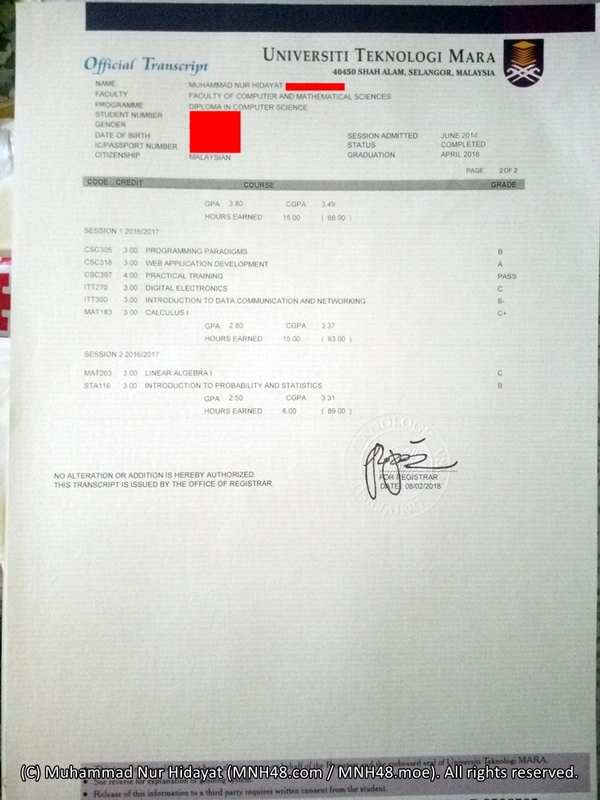 At there, I was assigned to the physics stream, which is expected since out of three science subjects I took in SPM, physics has the highest grade (B+) followed by chemistry (B) and biology (C+). We were also briefed about the curriculum of form 6, which I didn't really care of as I'm waiting for UPU result and waiting to say goodbye to the school, and briefed about the MUET test, about the school surroundings and buildings, among others. 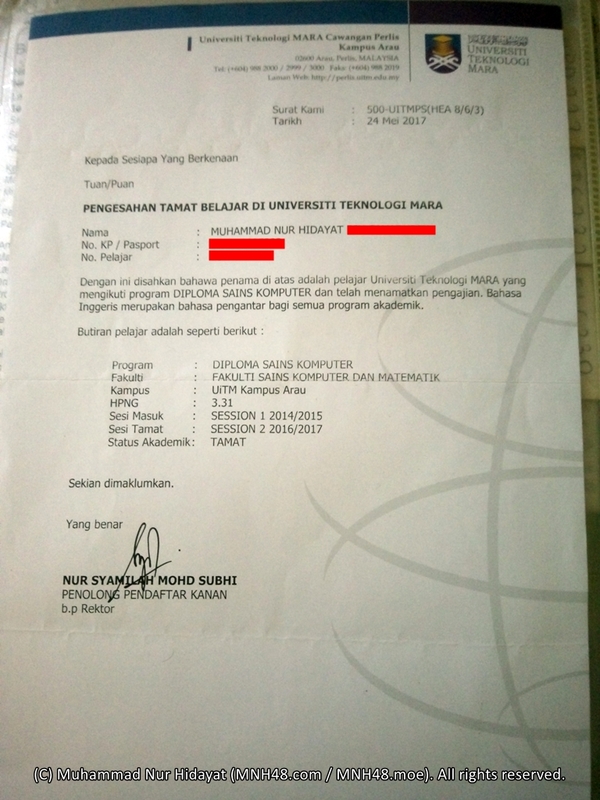 When UPU result was out, apparently I was ineligible for the engineering programmes and I was offered my third choice, "Diploma in Computer Science, at Universiti Teknologi MARA (UiTM), Perlis branch Arau campus". 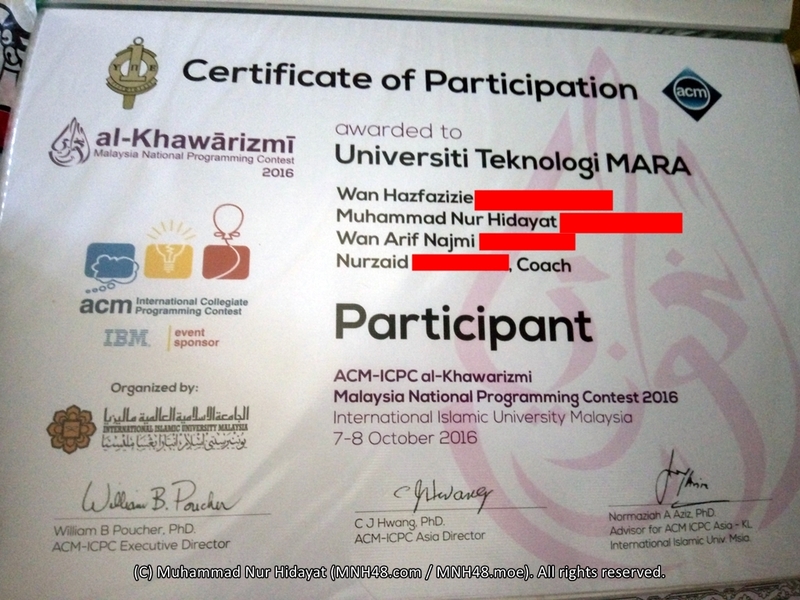 While I was sad I didn't get engineering programme because I might not be able to go oversea, but I was happy that the programme I got is something I'm actually interested in. Google Street View of entrance to UiTM Perlis. Buildings in UiTM Perlis, click on the area to read the building name. 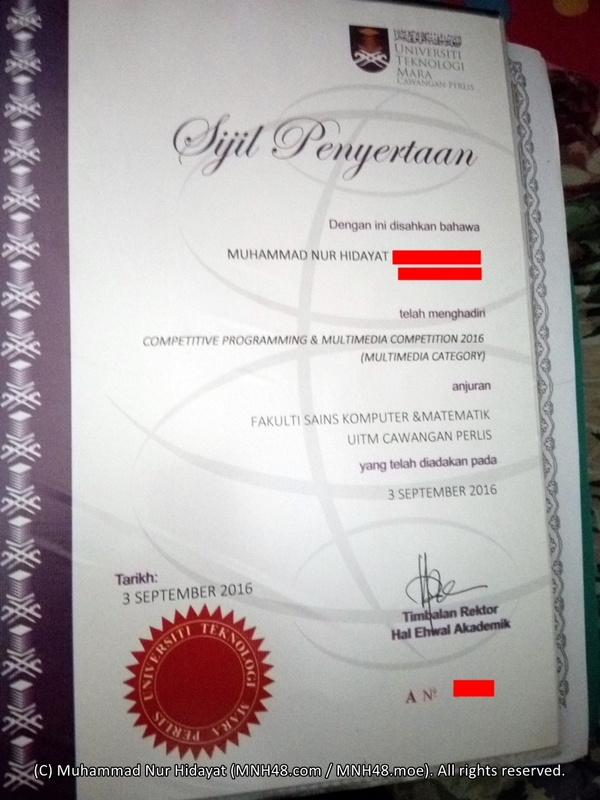 In June 2014, at the age of 17, I stepped into the university as student of diploma in computer science. This is also the first time I'll be staying in in-campus residential hostel away from my family. 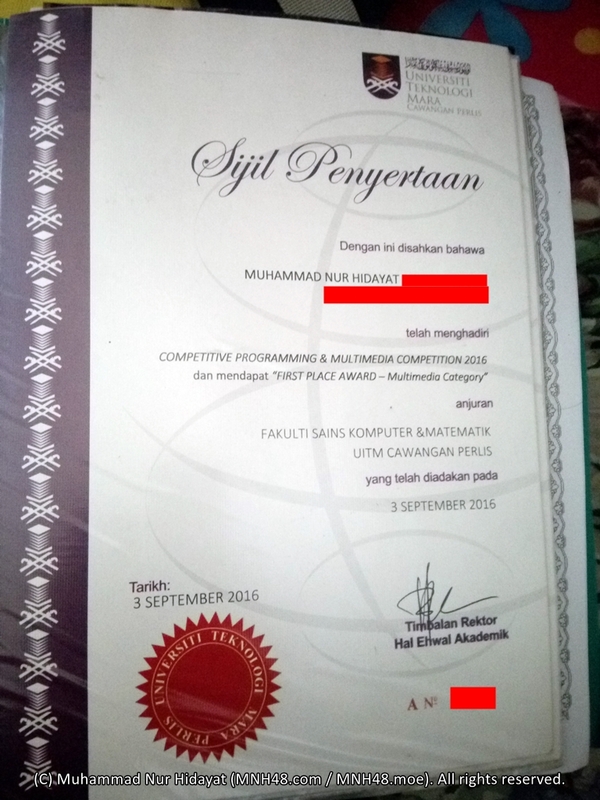 I was assigned to one of the blocks which happened to be very close to the mosque, Masjid An-Nur, and I had to join many mandatory religious events due to it for the first semester. Instead of the normal five-day orientation week, we had a very short orientation for just two days because of lack of time, as the campus was used for sports event and the residential hostels were used for athletes and staffs just before our admittance. The rules were quite strict, but not as strict as matriculation. We're also introduced to the campus buildings and surroundings. Other than attending classes, and co-curriculum activities for the first three semesters, we could also join many clubs and attend their activities, or just go out of campus for sight-seeing places around the town. There is a curfew in campus, where we're expected to return to our hostel before 12am or after 5am every day, because the main gates are locked from 12am to 5am for security reasons. There are three of us in our room of the residential hostel during 1st semester, and I sleep on the floor because I got the top bed of double-decked bed but I'm the kind of person who couldn't use ladder and I'm afraid of height. There are also coin-based washing machine and dryer, so it is really helpful since I don't know how to wash my clothes manually. Each floor of the hostels also has their own clothes lines for us to sundry our clothes if needed. There's also a television room with basic Astro subscription and a reading room with public WiFi hotspot. In this semester, I was still trying to adjust myself to the environment, so I don't make much friends. 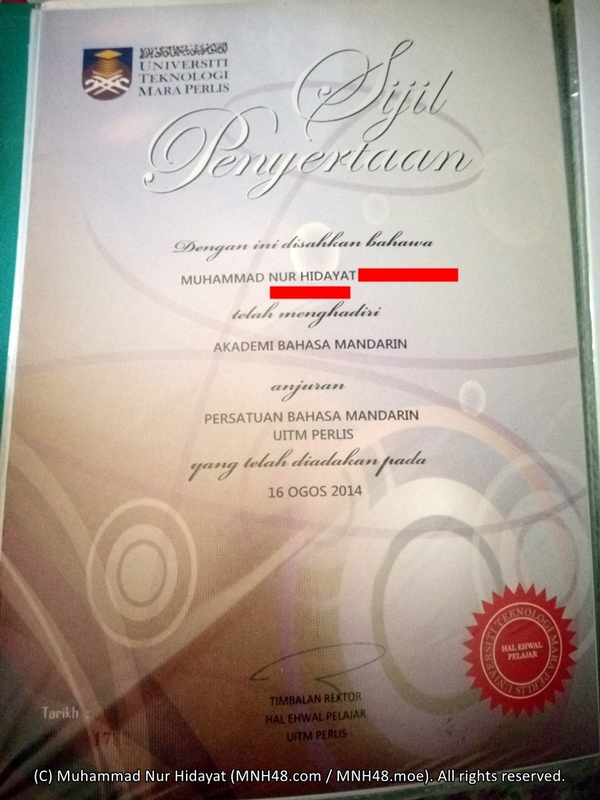 As I want to continue speak Chinese, I joined the Mandarin Club and tried to attend every activities that they have organized, including the Mandarin Academy, a full-day event of learning and practising Mandarin, with certificate. At the time, I still use the older smartphone, Samsung Galaxy Y running Android 2.3.6 (Gingerbread) with limited storage space so I don't have much pictures or videos. I mainly use it for WhatsApp as it is the main form of communication between students and lecturers, and most important information are shared on it first before released on notice boards. On the first day of lecture, we gathered in the wooden hall, also known as "oven hall" (dewan seri ketuhar) because of the heat in the hall due to poor ventilation, and formed many lines which eventually became groups of classes. I was lining up at the last line, the G line, so I get into the class CSD1Gf. Then they start to appoint class representatives for each classes and gave out the timetables for all classes. They also introduced a few important lecturers that we could contact in case we need them. The second day, all of us went out to search for the actual classrooms to attend the classes, we asked around seniors in the campus to get to classroom because it's scattered around and not centralized. Computer labs are at completely different blocks and even the normal classrooms are divided to different blocks situated far from each other. As for the mandatory co-curriculum, we could choose either to (1) be in National Kesatria for all three semesters, (2) be in National Kesatria for one semester then change to other eligible co-curriculums, or (3) be in other uniformed co-curriculum for all three semesters. 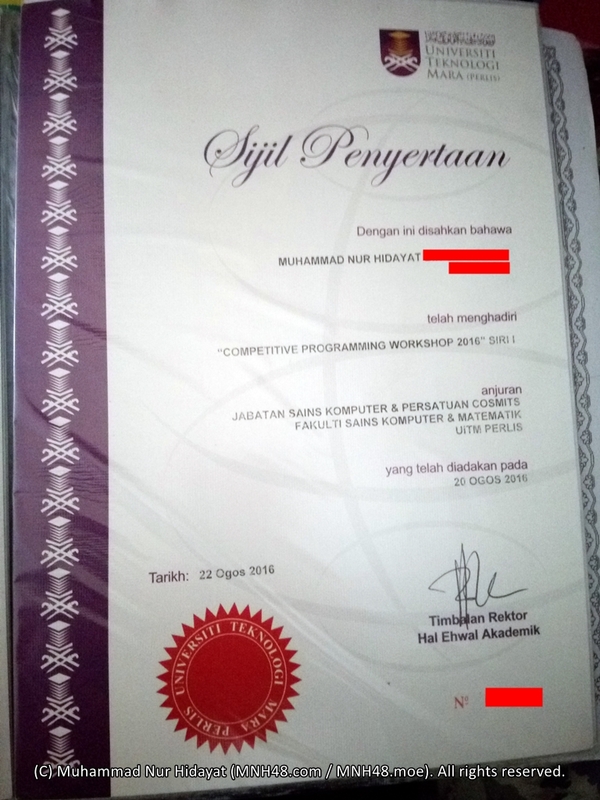 Since the co-curriculum I wanted is only available after a semester of National Kesatria, I chose the second option. National Kesatria is basically a lower version of army, where we learnt discipline and strict rules, and do marching and other milder version of army-based stuffs. Males are required to keep short hair, females are required to wear only approved accessories and no jewellery are allowed. At the end of semester, we sat for final examination. I failed pre-calculus and I had to retake it the next semester. Since pre-calculus is a prerequisite of calculus I, I can't take calculus I yet until I passed pre-calculus. Since we need to apply for residential hostel if we want to continue staying in-campus the next semester, I applied for it at the end of semester. Since we will get different rooms the next semester if we passed the application, or we would not get any room if we failed it, they provide a store room to store our stuffs like pails, books, hangers, cutleries, pillows, with a small fee, in case we don't want to bring all of it home since we will need to bring all of it back here the next semester. I stored a box and a pail full of my stuffs in the store, and get back home only with my clothes. I have rewritten the timetable of my class during semester 1 at here. My class timetable in June - October 2014, with classroom in italic. December 2014 is the start of 2nd semester. As I mentioned earlier, I had to retake pre-calculus before I can take calculus I, so I had to register class that offered it, the H class, CSD2Hf. 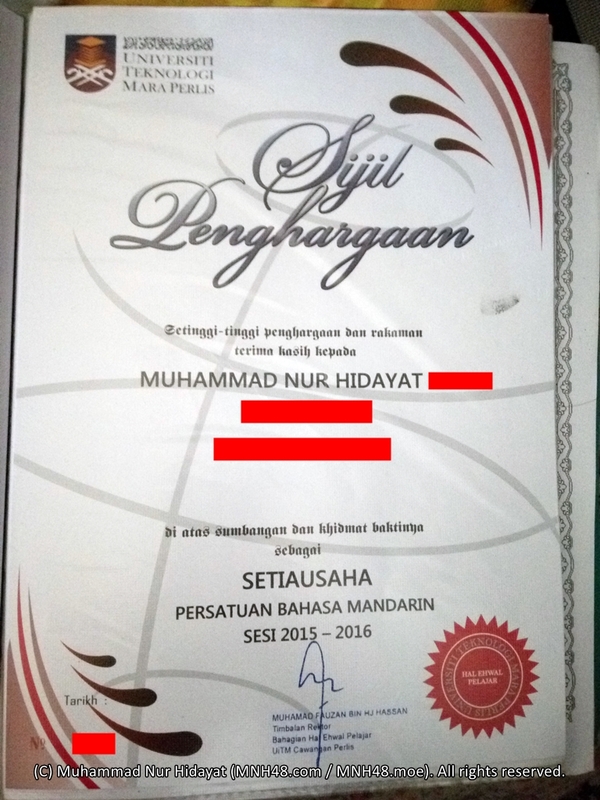 As for the co-curriculum, I finally able to choose something that suits me, that is Malay Public Speaking I. I choose it partly because it's in a classroom (unlike previous semester where we're directly under the sun at the marching field), and also because I think it will be easier to get good grade as it's about speaking, something I usually do. Well, I was almost correct, though it turns out to have many different elements as to how to do a good public speaking. At the end of the semester, it's time for final examination again. 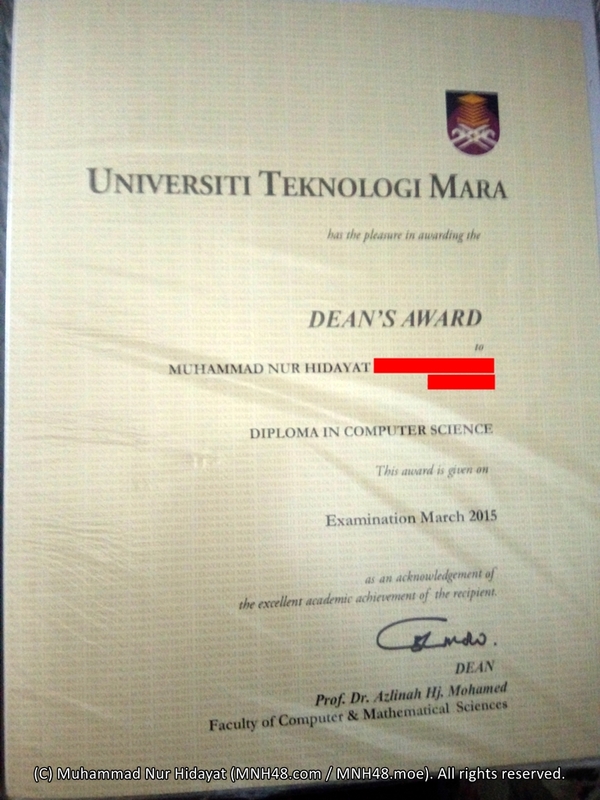 Since most of the other courses in this semester were easy for me, and I passed pre-calculus, I get to be in Dean's List to get the Dean's Award in this semester. I have rewritten the timetable of my class during semester 2 at here. My class timetable in December 2014 - April 2015, with classroom in italic. I have rewritten the timetable of my class during semester 3 at here. My class timetable in June - October 2015, with classroom in italic. I have rewritten the timetable of my class during semester 4 at here. My class timetable in December 2015 - April 2016, with classroom in italic. I have rewritten the timetable of my class during semester 5 at here. My class timetable in June - October 2016, with classroom in italic. I have rewritten the timetable of my class during semester 6 at here. My class timetable in December 2016 - April 2017, with classroom in italic.